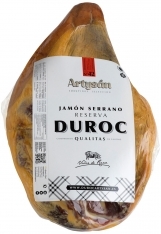 This serrano shoulder ham is semi-fat, with a medium to high cure. Its name comes from the custom of curing meats in the high mountains where the cool, dry air is perfect for a slow, traditional cure. 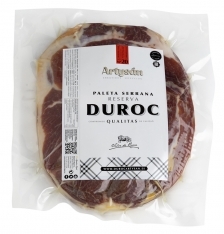 In Spanish, this product is called, paleta serrana duroc Artysán entera. The Miguel Alejandro group combines dedication, experience technology and security to obtain high-quality natural products every time, following the traditional methods of creating and treating their products. 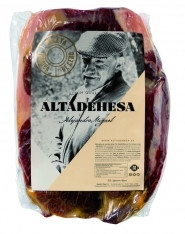 Miguel Alejandro rands include select Artysan smoked sausages and cured meats, as well as the prestigious Duroc pork. Its facilities have enabled it to open new markets, and the meat export market is the company’s most ambitious undertaking to date. Format : This package is presented in a cardboard box for safe transit. 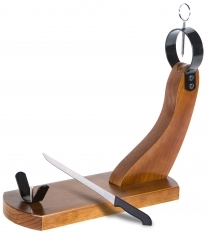 Storage : This product should be stored in a cool, dry place, away from direct sunlight. Consumption : This product is best consumed within one year of purchase. 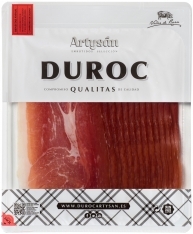 Once opened, it is best to eat the product within a month to enjoy its flavor at its best.